Hi. Recently I’ve been making my underwear. I thought I’d share what I’ve learnt so far. I bought the Thread Theory COMOX TRUNK KIT some time ago. And I made them almost immediately. I was worried about getting the wrong fabric so the kit was ideal. Leaving me with swatches to take shopping with me. Then I didn’t make any for ages. Then I found this 4 way stretch cotton jersey on EBay and thought, for £3 a pair, I might as well give it another go. The initial pair came up a bit big, I like a bit of support in my underwear, so I traced out a size smaller. I also went for the easier option of leaving out the front opening. Preferring (as Morgan from Thread Theory so eloquently put it…) to go ‘over the fence’ as opposed to ‘through the gate’. Ha! The SEWALONG is great. The BEST piece of advice is to ALWAYS START WITH YOUR NEEDLE DOWN. I found this invaluable. Something clearly more important than the snapping of my cutting blade had taken place. After completing one pair, the twin needles started going in different directions and snapped off. Repeatedly. Undeterred, I finished the other pair solely on my sewing machine. 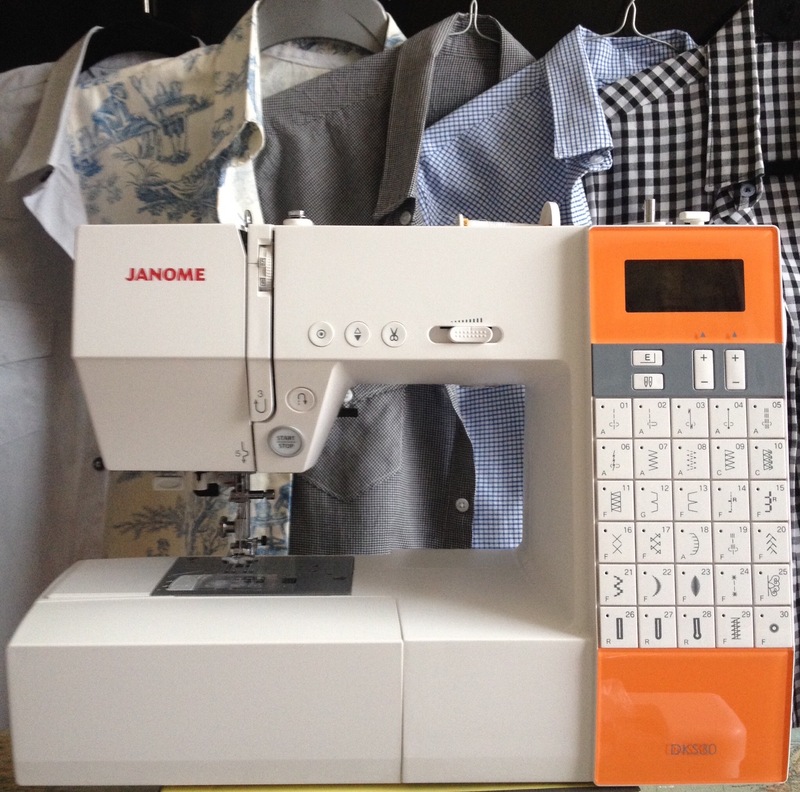 My trusty JANOME DKS30. The initial pair, I made using the reinforced stretch stitch (triple stitch?) and was pleased with them. The stitching was robust but looked a bit heavy handed. This time, I used the lightening stitch, or stretch stitch. I zigzagged the seams using the foot with the stitch fingers on and top stitched down using the stretch stitch again. 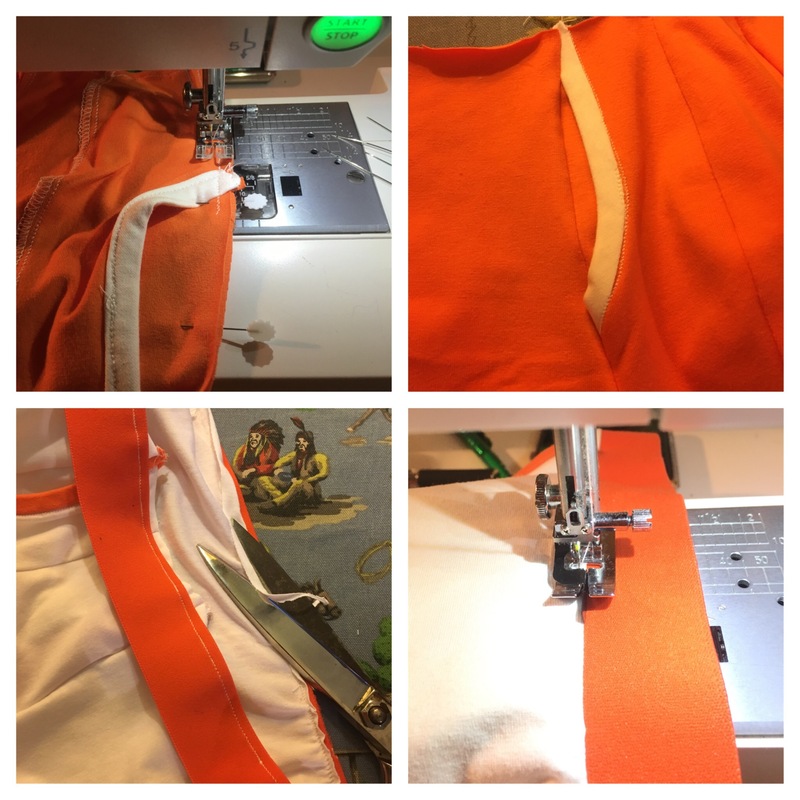 I’m especially pleased with the white stitching on the orange pants. So, next up, adding the opening. I made 2 pairs at once this time. White & orange. It seems to be my problem attaching bias binding to both sides at once. Rather than practise this, I decided to sew it on in 2 goes. Stitching (almost) in the ditch 2nd time round. This wasn’t foolproof. And probably needs as much practise as the in-one-go method! So here it is, edges bound, opposing fronts together, front ‘pouches’ complete! Sewing the sides and the back to the front all happens very quickly. This time I made sure to keep the opening open. Pinning it practically at right angles to the seam. I stitched everything together with the stretch stitch. 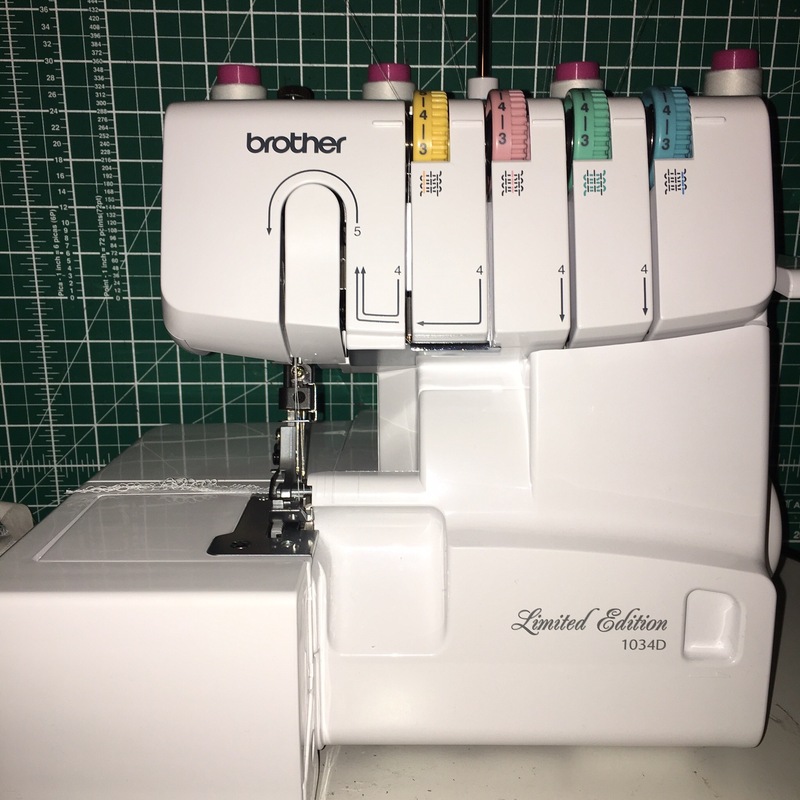 Having noticed that it was always the left needle breaking on my overlocker, in lieu of a proper fix, I rethreaded using just the right needle for a narrow overlock stitch. I’ll have to look at it properly another time. I actually preferred using my regular machine to make them & the overlocker just for seam finishing. It felt more like sewing again. And as the overlocker got the seams nice and narrow, I didn’t top stitch them down. I put the waistband on right side to right side. With the stretch stitch again. Then trimmed & stitched just below the elastic from the right side. My stretch stitch comes out a little to the left, off centre. I think I read this is supposed to happen, but I’m not sure why. It helps to keep even on the top stitching when using the stitch-in -the-ditch foot as it sews just off the line..! 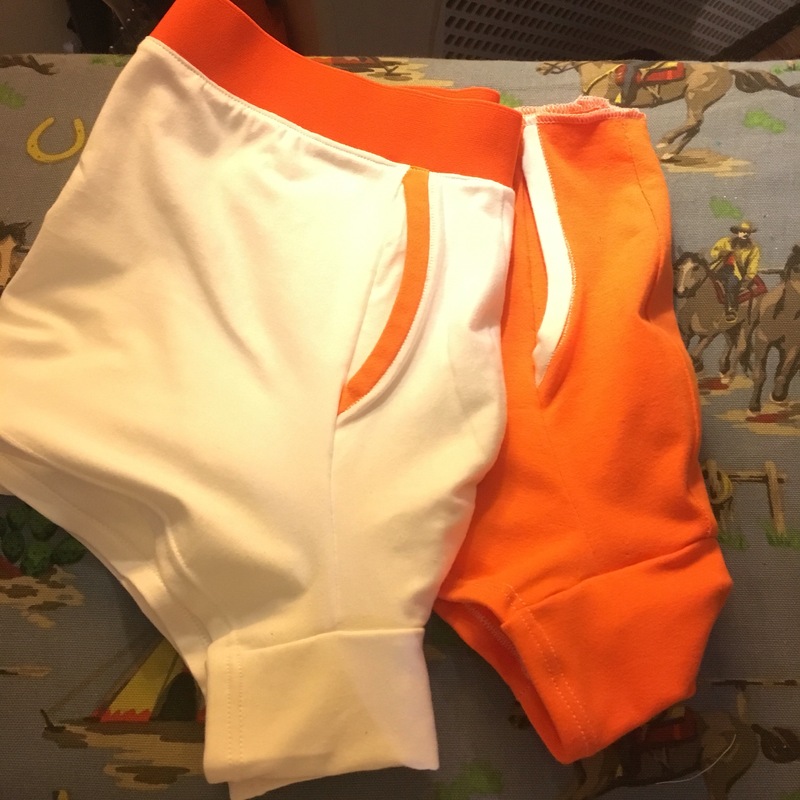 I didn’t have any white elastic to put on the orange pair, so they’ll have to be finished another time. I’m really pleased with them. I love the contrast. The stitching on the binding is pretty ropey, but I’ll try harder next time! And now I’ve invested in some wide twin jersey needles I’m really getting into twin needle hemming ! 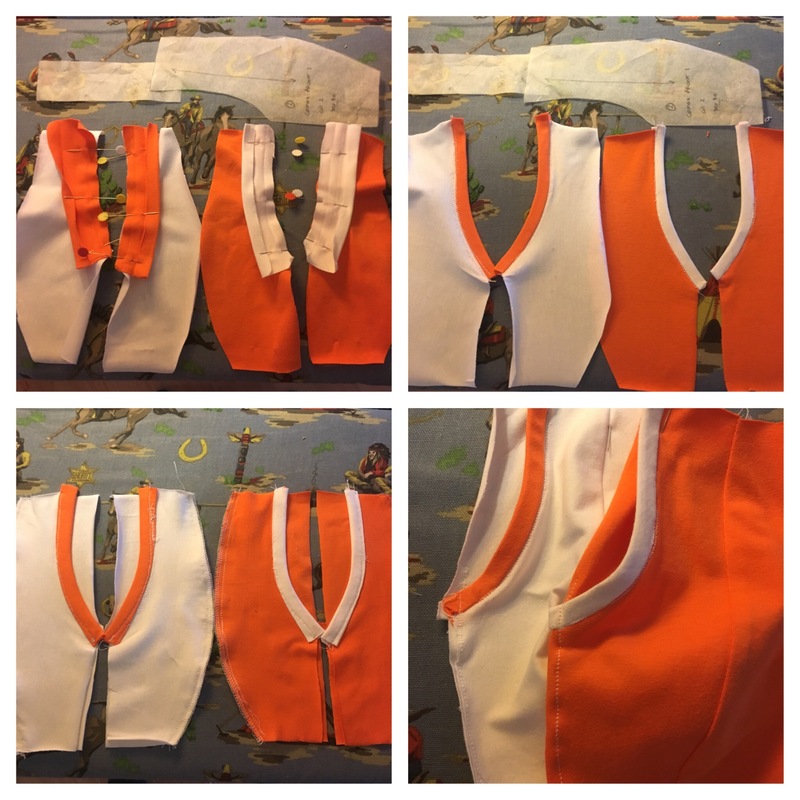 Practise sewing bias on in one go! Great Blog, maybe this will inspire me to have a go too, my fella likes this type of underwear. The orange ones look great. Thank you. It’s worth looking around for a nice soft elastic, I finally found one by prym but not many colours… Happy sewing!